After last weekend’s major snowstorm one wonders what other weather oddities we have yet to experience in this uncharacteristic year of weather. Here in St. Peter, 8 to 10 inches of snow accumulated from early Saturday to early Sunday, and similar amounts were recorded throughout southern Minnesota including the Twin Cities. The temperature during the storm hovered just below freezing, which meant that all the snow that fell was of the wet, heavy variety and resulted in downed trees and power lines (and power outages). Not since the Halloween blizzard of 1991 has the southern half of Minnesota seen so much snowfall before Christmas. While a lot of the snow has since melted thanks to temperatures above freezing, these temperatures haven’t been warm enough to cause a quick thaw and thus at least in St. Peter most of the ground is still covered in a blanket of white. Today’s high temperature however is supposed to approach 40 degrees Fahrenheit, as is the temperature on Sunday, but after that temperatures are expected to drop again (with lows possibly in the teens and single digits) with a few days of snow in the forecast. 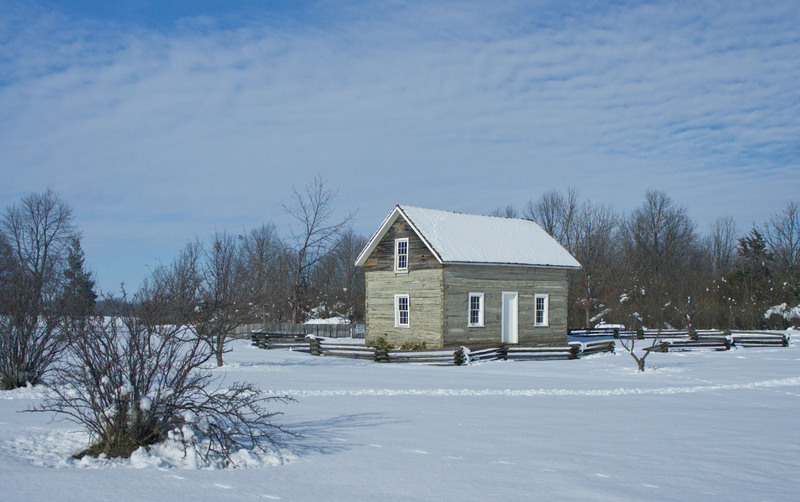 The Borgeson Cabin and vicinity two days after the snowstorm, 11/15/10. As expected, many of the trees that still had leaves attached to their branches lost their foliage during the snowstorm. Particularly the American Basswoods surrounding the Interpretive Center are now rather barren, their leaves never having turned yellow in their usual method of senescence (probably due to the unseasonably warm temperatures through October and early November). Many of the oak trees have also lost their leaves; oaks often hold onto their leaves throughout winter due to strengthened petiole attachments, but a strong wind (as was observed during the snowstorm) can cause them to detach. And finally, the Kentucky Bluegrass that had been greening up our lawns even through last week is now yellow and brown in color, the heavy snow cover and freezing temperatures having taken their awaited toll. **Due to the Thanksgiving holiday, the next scheduled update of “Arb Sightings” is Friday, December 3.